Killer Bunnies just keeps going up in funding as time goes on. 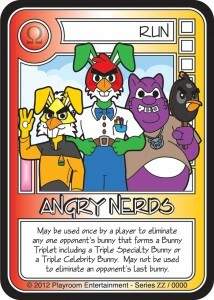 So they've decided it's time to reveal the promo card they've got for the event: Angry Nerds. We now have an image of the Omega 0 promo card! Everyone who pledges at the $10 Level or above will receive this card!